In all likelihood, last night’s episode of Futurama, the fittingly titled “Meanwhile,” was the last episode that will ever be produced. It’s not that the show’s quality has plummeted—although you’ll find few, if any, arguing that its revivals were the show’s best seasons—it’s just that it has run out of places to go. Futurama isn’t a cheap show to produce, and with both Cartoon Network and Comedy Central uninterested in more episodes, the number of outlets willing to spend that much money on a cult comedy show are few. Maybe, just maybe, someone like Netflix or Amazon will give Futurama some CPR, but after seven seasons and something like 140 episodes (depending on how you count things), it may be best if the show ends here. After all, “Meanwhile” was a moving episode of Futurama that, while perhaps not as great as the show’s original finale “The Devil’s Hands Are Idle Playthings,” was also a sort of greatest-hits album for the show. There’s almost nothing it didn’t feature. Crushing emotional development? Check. Clever time paradoxes? Check. A main character seriously and repeatedly injured? Check. Jokes about Zoidberg having $10 stolen from him? Double check. One of the best parts about this, though, was that by sticking with essentially one story the whole time, none of its representative parts felt out of place, instead cleverly woven into a fascinating, dark, beautiful story. The stakes felt higher than before, too, because this was a series finale, so the usual rules as far as what Futurama is willing to change in its status quo were gone. This is signaled to us at the beginning of the episode when we learn Fry wants to propose to Leela. There are big changes afoot whatever else happens; it’s only a matter of what else transpires along the way. That something, it turns out, is quite a doozy, coming in the form of the Professor’s latest time travelling invention, a button that takes the person who pushed it, and them alone, back 10 seconds. With a device like this deployed, it’s only a matter of time before we enter a time paradox, and for much of the show’s second act Fry is caught in one loop or another, eventually dying an infinite number of times as the rest of the crew bumbles about finding a method of saving him. One of the great things about “Meanwhile,” is also that it doesn’t particularly dwell on any of its acts, and all three of them are very, very different and to a large extent their own stories. Its first story leads perfectly into a second act of time paradoxes, but neither really prepares for the mesmerizing and, ultimately, devastating finale of a world stuck in time. It fulfills Fry’s wish beautifully, to preserve the moment of his wedding for all time, but the cost is steep. It was a chilling way for the show to end… and then all of a sudden it wasn’t. After three nearly perfect acts, with few misfiring jokes, clever science fiction and an abundance of strong character development, “Meanwhile” fumbled the ending. One of the most startling parts of the episode had been the Professor’s complete and seemingly irrevocable destruction, but once he reappears it’s a sign that bad writing is rearing its ugly head. He gives a half-assed explanation as to why he’s still around before telling Fry and Leela they can return home—but only if they are willing to lose all their memories. To call that a frustrating cop-out of an ending wouldn’t be enough to do it justice. The urge to return things to how they were before—unnecessarily so, I might add, considering that it’s a series finale that, if Futurama were to come back, the show could deal with then—undercuts everything we just saw. Erasing all of it cheapens the entire experience, and it’s one of my least favorite things the show has ever done, right up there with the Susan Boyle episode. The decision that none of what we saw matters calls into question why any of it was shown, period, and leaving the episode on a note that so obviously catered to a return was a dumb, pandering move. It’s such an awkward misstep that an episode which nearly had me in tears earlier ended with a sour note in my mouth. Part of my readiness for Futurama to end came from this conclusion, too. 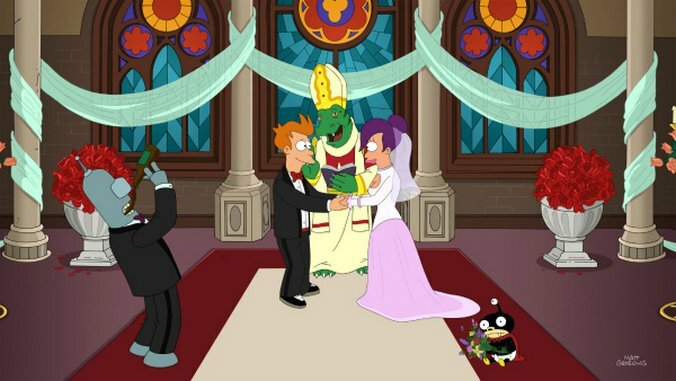 As much as they wanted to leave the show open for what’s next—presumably the first episode of a return would be a “real” version of Fry and Leela’s wedding—the show’s creators still seem unwilling to move things as far forward as they could. While the model of returning to the status quo at the end of every episode has its reasons, Futurama has grown out of that, and each time it ignores these big moments it also ignores what makes the show great. I’ve read that David X. Cohen and the rest of the writers didn’t understand why fans were annoyed at how Futurama disregarded Fry and Leela’s romance upon the show’s return, and that seems endemic of the problem. The audience only feels cheated if you don’t honor those emotional developments, and at the end of the episode it feels like Futurama is still unwilling to take that final step. Not to say that “Meanwhile” was a bad episode, as it was truly great, an epic 22 minutes that stood up to anything the show’s done before. But after toeing up to that line of doing something truly impressive and revolutionary for the show, they backed away again. I was disappointed, to say the least, but I still look forward to catching this episode as a rerun, and have already written fanfiction in my head as to what would happen were Fry and Leela allowed to return to the past with all of their memories still intact.